Do you want a healthy, energetic body in your 50s, 60 & 70s - without dieting? Well then, you're in the right place! Scroll down to read my personal story. without dieting or any crazy fitness regime. But this wasn't always easy for me, so I want to tell you my personal story. I am sharing my story because this is why I left a successful career in law . And why I'm so passionate about helping people like you discover the freedom and joy of using the Homemade Method™ to achieve your ideal weight - without dieting. Do you want a healthy, energetic body as a woman in your 50s, 60s & 70s? Well then you've come to the right place! 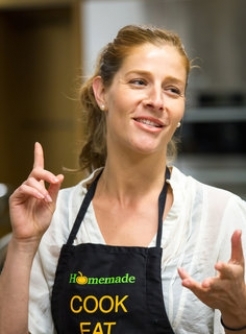 I'm Anna, Founder of the "Homemade Method". And I'm proud to have helped tens of thousands of women just like you to lose weight, reverse high blood sugars, pressure & cholesterol and get off meds - WITHOUT DIETING. I've got Masters Degrees from Stanford and UC Berkeley and I used to be an Attorney (I was the Australian Young Lawyer of the Year in 2008). I also competed in National Ice Skating Championships in Australia. I created Homemade Method with my Stanford MD Co-Founder, Dr Chloe Chien, and a team of over a dozen Doctors, Nutritionists & Holistic Chefs. We've also worked with organizations like Google, Stanford Hospitals, National Kidney Foundation and Da Vita Medical because our approach is simple and it works. When I was competing in National Precision Ice Skating Championships as a teenager, I was tortured by my eating and obsessed with losing weight. I was constantly dieting and would go from severely restricted calories to binge eating. I tried everything from fad diets, to special pills, food diaries, counting calories and weighing myself a million times per day. It makes me feel vulnerable to share this with you because no one in my life knew about my struggles with my weight and my eating. As an adult it didn't get better: It got worse. And then guess what I did after I ate all that caramel slice? Well, of course, I went to the deli downstairs and bought MORE CANDY. Why? Because we all know that eating is the best solution for everything - especially drowning our emotions and guilt. Another time, I remember sitting down to a pasta dinner with my housemates and just eating the pasta sauce - without the pasta - because 'carbs were bad'. I remember the feeling of isolation I felt at the dinner and how all I could think about was the food. Then I remember sneaking into the kitchen after dinner and wolfing down the pasta when no one was looking because I felt so deprived. I remember the shame of hiding what I ate in private. These are just two stories of literally thousands I could share. Each time, I failed my own expectations and thought I was just being weak and undisciplined and vowed to do better next time. I know that you have the ability to achieve your ideal weight and optimum health, no matter what your starting point, if you use the right system. I believe that the Homemade Method™ is the most effective, easy & sustainable way to achieve your weight & health goals - without dieting. I believe that enjoying vibrant good health and being confident in your body is essential for a happy & fulfilling life, and for your family to thrive too. Most importantly, I believe that no matter what your dreams or obstacles, YOU already have the power to change your life and be your best, healthiest self. This philosophy, dogged determination, and lots of hard work, led to the creation of the Homemade Method™. 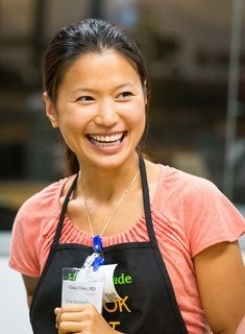 I was fortunate to work with my amazing Stanford MD Co-Founder, Dr Chloe Chien, and a team of over a dozen Nutritionists and Holistic Chefs in developing our system for sustainable healthy lifestyle change. From these folks, all my Members, and many others, I continue to learn new things every day and expand my own ideas of how to be my best, healthiest self. "What I didn't know at the time is that the problem was the dieting mindset!" One day, I had enough. I realized that dieting had never gotten me anywhere but had caused me endless guilt, disappointment and wasted energy. I had tried so hard to lose weight for years... but then I always gained it back again. I decided to stop dieting and restricting my eating. 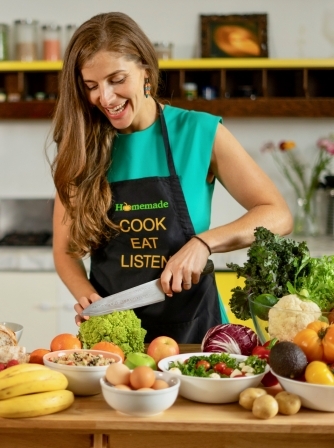 Instead I started listening to my body and I focused on feeling 'well-being' which took me to fresh, home-cooked meals made from whole ingredients, instead of processed foods or packaged so-called 'health foods'. "To my surprise, instead of gaining weight, it dropped off me." I never looked back. I achieved my ideal weight and have easily maintained it for over a decade, without any calorie counting or deprivation. I finally found freedom from dieting and discovered a positive relationship with my food. Now, I eat whatever I want and as much as I want until I'm satisfied. I do all the 'wrong things' - like eating carbs and fat and meat - yet I never gain weight and I am vibrant & healthy. 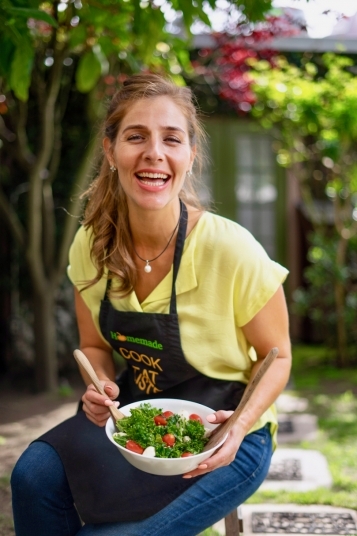 I then spent the next 10 years on a quest - with a team of Medical Doctors, Nutritionists & Holistic Chefs plus over +1,000 Members - to develop and perfect a system that would work for anyone. And so the Homemade Method™ was born. "I know you already have everything you need to be your best, healthiest self." Welcome to the Homemade Method. My number 1 passion and commitment is to empower you, my Members. Through our free content, our paid online programs, and whatever else we throw in the mix, we're in this to make a difference. To help you be your best, healthiest self. Whether you want to lose a few pounds (or a lot), improve your blood numbers, or be a positive role model for your kids, we're here to help you get there. I CAN TEACH YOU TOO. I'm not perfect - I am a work in progress. My life, health and body is a constantly changing, dynamic practice. There's good days and bad days. I don't have all the answers and I make mistakes. But my commitment to you is that I'm constantly learning from the very best and the very latest - and I bring you the very best of what I'm living. And you can expect me to keep it honest & fun as we go and to be there with my team to support you every step of the the way with what I consider to be the very best system to lose weight without dieting and be your best, healthiest self. If you're still reading, thank you~! I hope this is just the beginning of our relationship. And I'd love to get to know you. The best place to start and stay connected is to join my Homemade Method Community - just click below and enter your name and email. Thank you so much for taking the time to read my story. I'm so glad you're here and I'm excited for the journey ahead! "Do expect to be surprised & delighted by the world's most loved system to be your best healthiest self." Join our Homemade Method Members who have cooked over 100,000 meals and lost weight - without dieting.